HRM can import and export images from/to a local or remote OMERO server. This feature is not active by default. Ask the HRM administrator for more information about the HRM/OMERO connector. If the connection between HRM and OMERO is enabled the OMERO logo will be is displayed in the Raw images and Results folders. Click on . 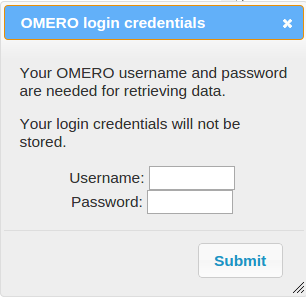 The following window will ask you to enter your OMERO login credentials. The OMERO credentials and file tree will be used throughout the HRM session, after that they will be deleted. The OMERO tree is requested automatically only the first time in every HRM session. This saves waiting time in subsequent import/export operations with OMERO. To force a tree rebuild click . Import data from OMERO: In the Raw images folder select an image from the OMERO tree and click . The image will be imported in HRM with extension .ome.tiff. Export data to OMERO: In the Results folder select the HRM image to be exported. Select the target OMERO dataset. Click . The image will be attached to the OMERO project with an annotation stating all the parameters used for deconvolution.